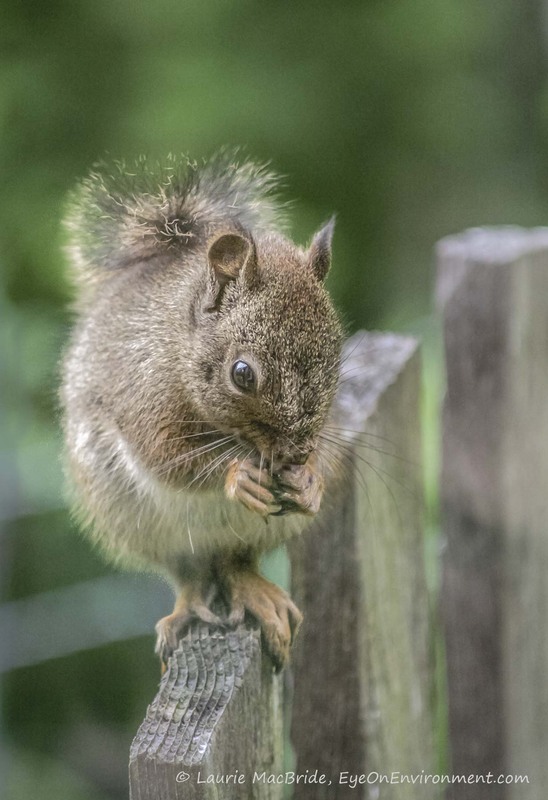 Unlike his larger grey cousin, our native Red Squirrel (Tamiasciurus hudsonicus) is seldom a nuisance: other than an occasional foray to chow down on the spillage under the bird feeder, he’s focused on collecting seeds from Douglas fir and maple trees to fill his larder. I enjoy watching him rush along his highway in the trees and scoot up and down tall trunks, using sharp claws and hind feet that can rotate to 180°. Sometimes we see him perched out on the thin end of a long maple branch, gathering maple seeds and tossing the unwanted seedcoats down like rain over our patio. Other times we see him sunning himself on a willow branch over our lower pond. Or perhaps he’s in one of our apple trees. He’s never still for long! The Red Squirrel is territorial, and it’s great fun to listen to his constant loud chatter as he barks, mutters and growls to defend his patch. Posted by Laurie MacBride, Eye on Environment on September 27, 2011 in Animals & Wildlife, Forest, Mammals and tagged animal behavior, communication, movement, nature, squirrels, territorial, wildlife.